A small Canadian satellite launching from India on Monday (Feb. 25) will be the first spacecraft specifically designed to search for large asteroids and monitor space junk in the solar system. The Canadian Space Agency's Near-Earth Object Surveillance Satellite, or NEOSSat, will seek out and track huge space rocks orbiting the sun from its position in Earth orbit, its builders say. The satellite will also track space debris and satellites still in service in Earth's orbit, splitting time between its two missions. 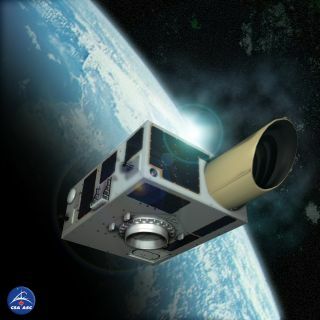 "The project with the CSA is essentially to survey the sky and get the best, improved near-Earth asteroid population and the ones that can sometimes cross Earth orbit," said Denis Laurin, a CSA space astronomy program scientist working on the NEOSSat mission. NEOSSat is due to blast off atop an Indian Polar Satellite Launch Vehicle at 7:20 a.m. EST (1220 GMT) on Monday from the Satish Dhawan Space Centre in Sriharikota, India. The PSLV rocket will also launch the larger SARAL ocean-monitoring satellite for the Indian Space Research Organisation and five other small spacecraft, including two tiny nanosatellites billed as the world's smallest space telescopes. One benefit to having NEOSSat in orbit and hunting for asteroids is that the satellite can survey the sky during Earth's night and daylight hours, Laurin added. Most ground-based asteroid mapping technologies today require a dark sky, but a space telescope like NEOSSat doesn't depend upon the night sky. When searching from orbit, the satellite can survey parts of the sky close to the sun, a nearly impossible feat for ground telescopes, said William Harvey, a CSA senior project manager with NEOSSat. NEOSSat will analyze the asteroids it monitors in great detail, giving scientists the chance to understand what the space rocks could be composed of and where their orbits take them, mission scientists said. The small spacecraft isn't capable of catching relatively small space rocks like the Russian meteor that exploded over the city of Chelyabinsk on Feb. 15, or asteroid 2012 DA14, a 130 foot (40 meters) rock that buzzed close by Earth on that same day. "NEOSSat will probably reduce the impact hazard from unknown large NEO's by a few percent over its lifetime, but is not designed to discover small asteroids near the Earth that may be on collision course," NEOSSat co-principal investigator Alan Hildebrand of the University of Calgary told SPACE.com. Instead, the satellite aims to track Atira and Aten class space rocks — asteroids that pass within Earth's orbit or occasionally cross the planet's orbit, Hildebrand added. "I'm hoping people will get interested in following up the NEOSSat mission with other missions. Maybe some of the asteroids will become candidates for future missions or mining," Harvey said. "They could be unmanned or other endeavors. It's a very interesting time. This could be the start of one of the next missions for humans." NEOSSat's mission is part of the High Earth Orbit Surveillance System project by the Defence Research and Development Canada agency, which is a partner in the mission with CSA. It was built by Microsat Systems Canada, Inc., which also built the CSA's small MOST space telescope that launched in 2003.